Our range of products include bone saw machine, bowl cutter, bone saws so 1650 f3 ( sirman), blenders with sound enclosure ( barmaster q), bowl cutter c6 ( sirman) and commercial rotisserie oven. Bone Saw Machine is highly professional, robust machine. It consists strong, stable working table with a smooth surface that is easy to clean, without dirt traps. It is widely demanded in restaurants, hotels and residential kitchens for cutting or crushing cardinal part of the meat. It also comprises detachable stainless steel waste-collecting pan for your ease. Bowl Cutter is designed and suited to cut up and emulsify meat, vegetables, and fruit. The Bowl Cutter is driven through an enclosed-gear with a covered slicing blade. It is one of the best and most economical commercial cutters in the market today. Sirman Bone Saws , model SO 1650 F3 :- Simple and sturdy machine: safe and easy to use.- table-top model; cast anodizedaluminium alloy contruction, polished, hygienic andrustproof.- cutting table, meat pusher and meat pusher in stainless steel AISI 304.- 24V controls with safety codified microswitches on the door and motor brake (according tonew CE safety rules).- Maximum blade adhesion to the pulley, thanks to the semi-curved shape of the pulleysand ideal adjustment.- Watertight bearings on upper pulley.- Easy cleaning thanks to 2 special manufacturing details:1) all the electrical parts are located below the cutting table (IP X5 waterprotected);2) by simply unscrewing two knobs, you can remove the blade, upper pulley and its support.- Powerful asynchronous and ventilated 4-pole motors protected by sealing oil ring.- 16 mm wide tempered ring-blades useful for cutting bones or meat (frozen or fresh). • The stainless steel body and bowl withstand heavy usage. • Motor and bowl are placed side by side to keep the heat from the motor away from the food. • The exclusive adjustable speed control allows for processing each product at its own speed. • See-through lid with 1 ¼” wide feed opening (2” on the C9 VV) to add products while machine is working. Opening can be closed to avoid spills with supplied cap. • The bowl has a special thermal diffusion bottom to be used on fire. • The handles on the bowl allow for easy removal and handling. • One interlock turns the machine off when the bar keeping the lid in place is moved to the side. • A second interlock stops the machine and prevents it from starting when the lid is not in place. • Knife and bowl are easily removable. • The processors flat surfaces are easy to clean. • The bowl (without lid) is dishwasher safe. Standard accessories: Lid cap, cleaning spatula, sharpening stone.Optional accessories: Serrated knifes shaft, emulsifying knifes shafts. 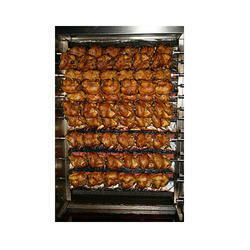 Commercial Rotisserie Oven allows you to roast meat, poultry, and even vegetables in your food service establishment. It rotates your food items to allow the heat source to evenly and consistently cook them. Sirman Meat Grinders , model TC 12 E :- Made from diecasted polished aluminium.- Ventilated motor.- Oil-bath gear box- Cast iron head and feeding worm . (Aisi 304 stainless steel on demand).- S/S plates and knives.- CE version:24 volt controls and NVR device. Sirman Meat Grinders , model TC 8 Vegas :- Anodized aluminium body and ABS shockproof sides.- Ventilated motor.- Oil-bath gear box.- Ground tempered helical gears.- Bright finished mouth and feeding worm.- S/S plates and knives.- Compartment for knives and plates.- Reverse (optional).- CE version with:IP 54 protection rated controls and NVR device. Sirman Slicers , model Topaz 220 :- Anodized cast aluminium alloy.- Lat base for easy cleaning.- Strong and silent-running asynchronous motor.- Reliable poliV belt drive.- Forged, hardened large thickness blades.- Carriage running on self-lubricating bushes.- Without built-in sharpener.- Teflon coated or toothed blades available- 25 blade inclination. Blade Diameter mm 195 - inch. 8"
Sirman Slicers , model Mirra 300 Y09 :- Anodized cast aluminium alloy.- Great distance between blade and motor for easy cleaning.- Ventilated motor.- Forged, hardened large thickness blades.- Carriage running on self-lubricating bushes and lapped pins.- Stainless steel screws and slice deflector.- Strong thickness gauge support.- Cast-in sharpener assembly.- Compact dimensions and great cutting capacity.- CE professional with device for releasing the carriage.- Teflon coated or toothed blades are available on demand.- 25 blade inclination. Sirman Slicers , model Palladio 350 Automec :- The Palladio Automec series offers the same outstanding feautures of the Palladio seriesadding.- Welded and rounded stainless steel automatism structure.- Piston/rod system carriage motion- Fan-cooled carriage motion motor with commercial-grade oil bath reduction- Blade and carriage motion powered by separate controls- An easily accessible switch arm can convert the unit from automatic to manual operation- Two control systems:. Standard on/off,. VV: on/off con variatore di velocità.- Output slicers per minute:. Palladio Automec: 37. 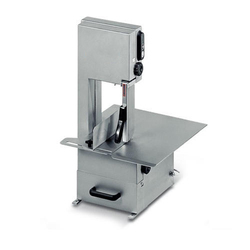 Palladio Automec VV: 40 - 50Optionals:- Nettuno hopper- Slice counterPalladio 350 Automec FrozenEspecially designed for slicing frozen meat up to - 12°C. Maximize your profits by combining efficiency, capacity, and simplicity with the Single & Double Tank Electric Fryer. It is affordable fryer and suitable for frying a variety of products. High efficiency ventilated motors for contuous operation. Easy to replace abrasive surface. Patented removable dishwashing safe safe container and bottom peeling disc (no tool required). Stainless steel outlet opening with quick and sealed locking. Adjustable S/S feet can be fixed to the door. Easy service and easy access to the components. Aluminium alloy ans S/S constructtion. The exclusive feeding system makes easy to process also soft products like mozzarella cheese. Large number of discs availablefor every purpose. Aluminium-Stainless steel top with 360 degree loading feature. Exclusive hopper design with no central chopping wedge. Our Slicing Machine is unique in the market. It is strong and accurate, facilitating a perfect cut through its reliable operation. Its entirely stainless steel and open design ensure ease of cleaning and complete hygiene. Sirman Vegetable-cutter , model TM2 Inox :- Aluminium alloy and S/S construction.- Ventilated motor for continuous operation.- Thanks to its compact design the machine is easy to install inside every kitchen.- The exclusive feeding system makes easy to process also soft products like moz-zarellacheese.- Safe operation is ensured by interlock switches on product pusher, lid and collect-ing tray.- Version with dishwashing safe S/S lid available.- Large number of discs available for every purpose. Perfect filtration: large basket with very fine sieve (0.5 mm / 0.02'') offering a high quality juice. Maximum juice extraction: excellent yield. Silent: perfect to make juice in front of the customer. Safety: Electric cut off and motor braking stopping the basket when opening the handle. Exclusive Ezy-clean™ system: Removable bowl, basket and cover (no tool needed). Spout height: 200 mm (8.6"), to make juice in glasses, jugs, and blender jars. Sirman Slicers , model Topaz 275 :- Anodized cast aluminium alloy.- Lat base for easy cleaning.- Strong and silent-running asynchronous motor.- Reliable poliV belt drive.- Forged, hardened large thickness blades.- Carriage running on self-lubricating bushes.- Cast-in sharpener.- Teflon coated or toothed blades available- 25 blade inclination. - Capacity to 1 level: 2 pizzas Ø ≤ mm 225. 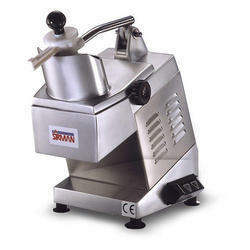 Sirman Slicers , model Topaz 250 :- Anodized cast aluminium alloy.- Lat base for easy cleaning.- Strong and silent-running asynchronous motor.- Reliable poliV belt drive.- Forged, hardened large thickness blades.- Carriage running on self-lubricating bushes.- Cast-in sharpener.- Teflon coated or toothed blades available- 25 blade inclination. • Induction direct drive motor for intensive use. • 2.5 Qt. stainless-steel bowl with handle for better grip. • Bowl-base blade assembly with two high-strength, stainlesssteel, fine-serrated blades for homogeneous processing – even for small amounts. • Central lid opening for adding liquid or solid ingredients during processing. • High heat and shock-resistant see-through lid to monitor processing from start to finish. • Leakproof lid and bowl unit with bowl scraper arm and lid wiper. • All parts are dishwasher-safe and can easily be removed for cleaning. • 2.5 Qt. bowl with lid. • Bowl scraper arm and lid wiper. • Blade assembly with two fine-serrated, stainless-steel blades and a detachable cap. Sirman Bowl Cutters , model C9 Vv-Usa :• Increase productivity in the kitchen with a multi-tasked bowl cutter for cutting, mixing andemulsifying • Complete stainless steel construction • Rotary dial variable speed control tostabilize blade rpm, from 1,100 to 2,600 rpm to process each product with the right speed •Motor alongside the bowl avoids cooking of the food • See-through lid with feed opening toadd product • Quick breakdown for cleaning • Prepare sauces - bechamel, bolognaise,mayonnaise, tartar, vinaigrette... • dressings - French, Italian, creamy ranch, coleslaw… •fish & meat - smoked salmon pate or mousse, anchovy paste, steak tartar... • soups -onion, potato and leek, split pea, tomato... • minces - bell peppers, parsley, onions...Features »Technical•The stainless steel body and bowl withstand heavy usage.• Motor and bowl are placed side by side to keep the heat from the motor away from thefood.• The exclusive adjustable speed control allows for processing each product at its ownspeed.• See-through lid with 1 ¼” wide feed opening (2” on the C9 VV) to add products whilemachine is working. 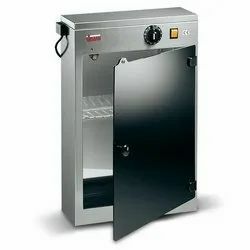 Opening can be closed to avoid spills with supplied cap.• The bowl has a special thermal diffusion bottom to be used on fire.• The handles on the bowl allow for easy removal and handling.• The motor and knife shafts are sealed to avoid leaks to the motor.Safety• One interlock turns the machine off when the bar keeping the lid in place is moved to theside.• A second interlock stops the machine and prevents it from starting when the lid is not inplace.• Overcurrent and no volt release protection.Sanitary• Knife and bowl are easily removable.• The processors flat surfaces are easy to clean.• The bowl (without lid) is dishwasher safe. Standard accessories: Lid cap, cleaningspatula, sharpening stone.Optional accessories: Serrated knifes shaft, emulsifying knifes shafts.SpecificationsConstruction: Body and bowl made from stainless steel. See-through lid made from Kostil™plastic. “S” blade knives made from high-quality cutlery stainless steel. Shaft made fromhigh-resistant Moplen™ plastic.Knife RPM: Adjustable, from 1100 to 2600Motor C 4 VV: 1/2 Hp (400W), belt-driven, fan cooled.Motor C 6 VV: 1/2 Hp (400W), belt-driven, fan cooled.Motor C 9 VV: 2, 1/2 Hp (400W) each, belt-driven, fan cooled.Electrical C 4 VV: 120V AC, 60Hz, 3.4 Amp. (220V, 50Hz available on request).Electrical C 6 VV: 120V AC, 60Hz, 3.4 Amp. (220V, 50Hz available on request).Electrical C 9 VV: 120V AC, 60Hz, 6.8 Amp. (220V, 50Hz available on request).Plug & Cord: Attached plug, flexible, 3 wire SJT 18 AWG, 6” long cord.Controls: Keypad with “ON” (“I”) and “OFF” (“0”) buttons, green (machine connected)and orange (machine working) pilot lights. •The stainless steel body and bowl withstand heavy usage. •Motor and bowl are placed side by side to keep the heat from the motor away from thefood. •The exclusive adjustable speed control allows for processing each product at its ownspeed. •See-through lid with 1 ¼” wide feed opening (2” on the C9 VV) to add products whilemachine is working. Opening can be closed to avoid spills with supplied cap. •The bowl has a special thermal diffusion bottom to be used on fire. •The handles on the bowl allow for easy removal and handling. •One interlock turns the machine off when the bar keeping the lid in place is moved to theside. •A second interlock stops the machine and prevents it from starting when the lid is not inplace. •Knife and bowl are easily removable. •The processors flat surfaces are easy to clean. •The bowl (without lid) is dishwasher safe.Standard accessories: Lid cap, cleaning spatula, sharpening stone.Optional accessories: Serrated knifes shaft, emulsifying knifes shafts.SpecificationsConstruction: Body and bowl made from stainless steel. See-through lid made from Kostil™plastic. “S” blade knives made from high-quality cutlery stainless steel. Shaft made fromhigh-resistant Moplen™ plastic.Knife RPM: Adjustable, from 1100 to 2600Motor C 4 VV: 1/2 Hp (400W), belt-driven, fan cooled.Motor C 6 VV: 1/2 Hp (400W), belt-driven, fan cooled.Motor C 9 VV: 2, 1/2 Hp (400W) each, belt-driven, fan cooled.Electrical C 4 VV: 120V AC, 60Hz, 3.4 Amp. (220V, 50Hz available on request).Electrical C 6 VV: 120V AC, 60Hz, 3.4 Amp. (220V, 50Hz available on request).Electrical C 9 VV: 120V AC, 60Hz, 6.8 Amp. (220V, 50Hz available on request).Plug & Cord: Attached plug, flexible, 3 wire SJT 18 AWG, 6” long cord.Controls: Keypad with “ON” (“I”) and “OFF” (“0”) buttons, green (machine connected)and orange (machine working) pilot lights. Sirman Drink Mixers , model Sirio 1 :A complete line of drink mixers with a modern soft design. Designed to commercial use,they meet all European and North-American safety requirements.- White or chrome head, aluminium stem and die casting base for a perfect stability, noedges or seams for easier cleaning.- Countertop (1 or 2 cups) or wall unit versions available.- Transparent 550 cc Tritan cup or stainless steel cup on request.- 900 cc stainless steel cup on 120 W version.- Powerful ventilated motor for a longer life.- Spindle with three aluminium and s/steel agitators for preparing cocktails and drinks, orwith a special round agitator for frozen coffees or for creamier results.- Safety microswitch on the cup support. 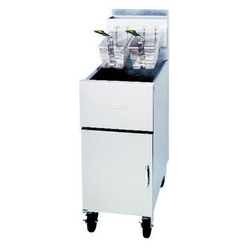 Machine Height - 79 cm, Width - 50 cm, Depth - 57 cm, Daily Ice Production - 30 Kg, Bin Storage Capacity - 14 kg, Ice Shape - Dice, power usage 17.3 Kwh, water usage - 131.5 L , 1 year warrent. Sirman Induction Hob , model IH 35 : The induction hobs are easy to install on every working surface in kitchens, restaurants or dining rooms; they are perfect for public cooking performances or when the preparation is made in view of customers. Graduated digital controls. Extremely easy to use and to clean. Smooth cooking surface makes cleaning easy. Safe operations are ensured by the cooking surface which is never heating up. Induction hobs are energy saving thanks to heating efficiency and no need to heat up. Electric absorption is stopped when the pan is removed from the hob surface. Sirman Induction Hob , model IH 35 Wok : The induction hobs are easy to install on every working surface in kitchens, restaurants or dining rooms; they are perfect for public cooking performances or when the preparation is made in view of customers. Graduated digital controls. Extremely easy to use and to clean. Smooth cooking surface makes cleaning easy. Safe operations are ensured by the cooking surface which is never heating up. Induction hobs are energy saving thanks to heating efficiency and no need to heat up. Electric absorption is stopped when the pan is removed from the hob surface. - Made from AISI 304 Stainless steel. - High efficency ventilated motors for continuous operation. - Stainless steel peeling disc. - Easy to replace abrasive surface. - Stainless stell outlet opening with quick and sealed locking. - Adjustable S/S feet can be fixed to the floor. - Special introduction hopper for easy loading of larger pieces. - High efficiency screw propeller. - Quick and easy disassembly of the parts used for processing. - Pestle for easy introduction of the products. - Equipped with 2 trays: one for juice and one for waste. - Equipped with 3 different drilling strainers. - High efficiency asynchronous ventilated motor. - Made from stainless steel. - Heating up controlled by a symosthat. - Galvanized steel gridiron and heating elements protection grill. - Easy to remove crumb pan. - Grindiron can be placed on 4 levels accordingly to the coocking requirements. Very Fast cooking with 4500 Watt heating elements! - Thermally protected heating elements. - High legs to keep clean the counter under the grill. - Detachable front drip tray. Thanks to its small size, it is easy to handle and to position, offering as well a large cooking surface. Ribbed and smooth surfaces available. • Direct drive induction motor (no belt) for intensive use. • Built in on / off / pulse buttons. • Magnetic safety and motor brake. • Vegetable preparation attachment equipped with 2 hoppers : 1 large hopper (surface : 14 sq. in.) and 1 cylindrical hopper (Ø : 2 1/4’’). Removable chute and feed lead. • Removable chute and feed lead for dishwasher safe and easy cleaning. • Side ejection for space saving and better user comfort to receive 5 7/8’’ high GN containers. • Automatic restart of the machine by the pusher. • Vertical pusher presses on vegetables for uniform cuts. • Cutter attachment: lid and high resistance stainless steel smooth blade assembly with removable cap. • Vegetable attachment : chute, feed lead ejecting disc and discharge plate. • Industrial induction motor for intensive use. • Motor base in high resistant composite material. • Magnetic safety system with motor brake. • Vegetable Preparation Machine equipped with 2 hoppers: 1 kidney shaped hopper to cut bulky vegetables, like cabbage, beets, celeriac, etc. and 1 cylindrical hopper for long, delicate vegetables. • Removable continuous feed lead. • Reversible discharge plate for processing delicate produce. • Lever-activated auto restart (by the pusher) • Vertical pusher pressure exerted on vegetables to ensure uniform cuts. • Large choice of 52 discs available. • Packed with two processing discs (28064 - 3mm/1/8” slicing disc & 28058 - 3mm/1/8” grating disc) as standard. • Stainless steel blades on slicing discs, blades on Julienne discs and grating discs are removable.